In 1946, when the hot new comedy team of Dean Martin and Jerry Lewis burst onto the New York nightclub scene, their outrageous irreverence was just the sort of excitement weary post-war American audiences craved. Extant footage of Martin and Lewis presents Dean as a classic straight man whose innate talents included the sort of precise timing that is the lifeblood of successful double-acts; Jerry as a comic powerhouse with boundless energy. For ten years, including 16 feature films made from 1949-1956, several high rating television appearances, and continued nightclub stints, the duo dominated the entertainment industry to an almost unprecedented level. Once the act broke up, each embarked on a solo career. Lewis had already emerged as more than a figure who wrote and performed comedy. On the set of the Martin and Lewis comedies, he absorbed information about camerawork, lighting and editing. However, other than a natural curiosity, Lewis initially had no real interest in directing. He wanted the director to bring out the best in him as a performer, and always hired veterans like Norman Taurog and George Marshall. The Martin and Lewis films were generally conventional Hollywood comedies about army life and haunted houses. Along the way, Lewis started making suggestions about how the films could be opened up, how the cinematic process might enhance certain physical gags. By the time he embarked on a solo career, he had a clearer idea of how comedy and cinema could merge in a more creative fashion. The best of Lewis’ early solo efforts were helmed by Frank Tashlin. Tashlin emerged from the surreal world of the Warner Bros. cartoon unit, rubbing elbows with the likes of Tex Avery and Friz Freling in an era where animation remained consistently close to the edge. Transferring this surrealism to live action comedy, Tashlin specialised in colourful slapstick where his penchant for sight gags always revealed his cartoon roots. Lewis was the perfect actor for Tashlin’s comic madness. The surrealism that Lewis himself envisioned blended perfectly with Tashlin’s vision. For the rest of his life, Lewis has referred to Tashlin as “my teacher”. In December of 1959, Lewis, with Tashlin directing, had just completed work on Cinderfella. Lewis played the title role in a gender-switch on the popular fairy-tale, and prepared the film for release during the Christmas season of 1960. Paramount Pictures insisted on a summer release, as Lewis’ features always tended to “draw big” and this was counted on to provide a seasonally based financial push. Lewis believed that a lavish comedy-fantasy with big sets, musical numbers, and a myriad of colourful costumes, would be far more effective during the Christmas holidays. In haste, he promised to make another film for Paramount to release in the summer. He had an engagement at the Fontainebleau Hotel in Miami, so he would put together a film that could be shot quickly at that establishment, using performers in the area to fill out the cast. He would direct the film himself. 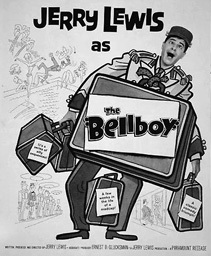 Hence, The Bellboy was born, as was Lewis’ career as a director. I was doing two shows a day at the Fontainebleau and writing and filming at night. I wrote the 165 page screenplay in eight days, shot it in twenty days straight with no time off, and edited in less than four weeks. I edited while appearing live at the Sands in Las Vegas. My editing equipment was down below in my dressing room. What Lewis created with his first directorial effort is a template for all of his subsequent self-directed films. Taking his cue from Tashlin, Lewis embarked on a career as an auteurist filmmaker that placed an outrageous character in the midst of his own surreal universe where everybody and everything is a bit off kilter. Without a standard plot or a linear structure, The Bellboy manages to appear more creatively inspired than hastily assembled. Lewis plays Stanley, a character who does not speak, in some ways a similar figure to Jacques Tati’s M. Hulot. But while Hulot was decidedly of this world, Stanley is in a world all his own. His is a world where one could easily hop in an airplane and take it for a spin, land it perfectly, and walk away whistling. These rather magical qualities of the central character meshed with the magic of the cinematic process. With its series of brilliant gag sequences, each more amusing and impressive than the previous one, The Bellboy emerges as a veritable homage to silent screen comedy; from its charming Stan Laurel tribute to its myriad of inspired gag ideas (evoking the exuberance and innovation of that great creator of comic forms, Buster Keaton). In every tumultuous slapstick scene, the opulent hotel’s luxurious decor, from its vast marble floors to its seashell drinking fountains, brilliantly offsets the movement at the centre of the frame. And with each gag sequence, Lewis uses a different aspect of cinema’s technology to make his comedic point. Time and space are examined in the gag where Stanley is asked to fill a huge, empty auditorium with chairs. When fellow bellhops check on him after only seconds, he is already completing his task. Later on, when Stanley fills his salad bowl near an empty lunch counter, he turns and discovers that the counter is suddenly swarming with people. Sound is explored frequently through accompanying music. When an overweight woman comes to the hotel for crash dieting, Lewis accentuates her slow movement with lumbering tuba music. When she exits a few days later, beautiful and svelte, her presence is accompanied by sprightly woodwinds. But it is true to his surreal cinematic world that just one box of candy transforms her immediately back into her previous obese condition. But perhaps the greatest technological innovation of The Bellboy occurred behind the scenes. Lewis came up with idea of videotaping the action while it was being filmed so that he, as director, could immediately examine how a scene played. Patenting it as the Video Assist, this is now a standard device on most movie sets. Along with the aforementioned approach to time, space, camera, editing, lighting, and sound, the film also marks Lewis’ evolution as an actor. The noisy kid character from the Martin and Lewis era is now a non-speaking observer in his own surreal universe. While the settings changed in each film, Lewis’ screen character became more extreme, his gags more explosive, and his use of sound and visuals more pronounced (for example, the set for his 1961 film The Ladies Man cost more than this entire production). He would always play the observer, the outsider trying to survive his tumultuous existence in the bizarre world on screen, and The Bellboy is the perfect primer for his subsequent cinematic ideas. He even revisited the character in his 1964 film The Patsy which attempted to place Stanley in the world of show business, despite a lack of talent or experience, believing that appearances are all that is needed. Jerry Lewis’ self-directed films are brilliantly conceived, cleverly surreal, and comically inspired. The Bellboy is where this process begins, and it is therefore among the most important comedies in American cinema.